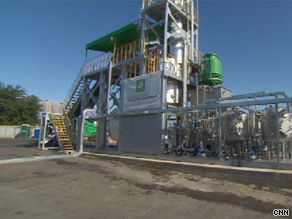 CNN's "The Situation Room with Wolf Blitzer"
WASHINGTON (CNN) -- Like the alchemists who once tried to turn lead into gold, a green entrepreneur says he has found a cost-effective method for turning plastic trash into oil. The Envion plant turns plastic garbage into oil by isolating petroleum from the plastic's other ingredients. During a recent visit to his new demonstration plant in Maryland, Envion CEO Michael Han describes his process: Waste plastic is shredded and melted and then processed in a way that separates the petroleum from the rest of the ingredients. At one end of the machinery, shredded plastic trash is dumped in a hopper and goes up a conveyor belt into a "reactor." At the other end is a spaghetti of pipes and valves and tanks. Han turns open a spigot on one of the pipes and produces a liquid the color of apple juice. It smells kind of like diesel, and Han claims it's ready to be processed for any number of uses: fueling cars, diesel generators or even jets. But not all of the ingredients in plastic can be refined into petroleum. All the chemicals that were added when the plastic was produced must be separated out and collected in a sediment tank. That could be a problem, says Kert Davies, a researcher with the environmental group Greenpeace. He has not visited the plant, but after reading Envion's literature, he asked, "what happens to the additives and the metals and the other things?" Envion is hoping to find asphalt makers who can use the sludge as an ingredient for paving after the metals are filtered out. Otherwise, it can be dried by microwaving and the dust sent to a landfill. "Then you end up with a different problem," Davies said. "Is that going to a hazardous waste landfill?" The Situation Room with Wolf Blitzer is the command center for breaking news, politics and extraordinary reports from around the world. But Han says that it's not hazardous, and most important, that the process releases no gas into the air. "You don't smell anything burning," he said. "We don't incinerate. We simply melt." Han set up his demonstration at the Montgomery County dump in Maryland. Amid bales of crushed yogurt containers and plastic bottles, there seems to be little risk that he will run out of trash to feed into his machine. Envion is pitching the technology to sanitation departments, promising it will cut down on their trash volume by consuming up to 10,000 tons of plastic per year while producing some revenue as well. The plant could produce up to 60,000 barrels of oil a year, Han says, and although some of that oil is used to keep the machinery running, the rest can be sold to an oil company for profit. The plant cost $4 million to build, but Han says it can produce oil for as little as $10 a barrel at a time when oil is selling for more than $70 a barrel. Davies said that "finding new oil to burn is not the goal. The goal should be to burn less oil." But Han said, "if there's a way that we can solve the problem of accumulation of waste plastic in our country and at the same time turn it into a byproduct that is cost effective, then I think it's a win-win situation."